In a few weeks time, the Obama White House will be asking the American people to help them identify the "grand challenges" in science and innovation that the country should tackle in the 21st century. And they'll be doing it, in part, on Twitter. 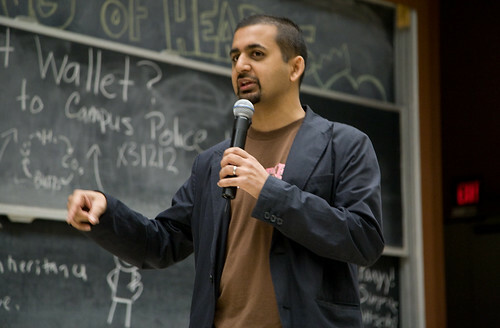 Anil Dash is best known in the tech world as a cultural curator, blogging evangelist, and one hell of PowerPoint Karaoke-er. But six months ago, Dash left the blogging company Six Apart and took up the helm of a new initiative called Expert Labs. Working with the White House, and as part of the American Association for the Advancement of Science under a MacArthur Foundation grant, Dash is working to connect policymakers with the vast community of knowledge that lives on the web. Can what we know in 2010 about the wisdom of crowds really improve policy making? It's an intriguing idea, but the devil is in the details. And in an interview this week via instant messenger, Dash was kind enough to provide them. [Scola] Let's start at the beginning. What is Expert labs? And what problem is it trying to solve? [Dash] Expert Labs is a new, independent non-profit effort that's trying at its most ambitious to improve the decisions policy makers make, by giving them the tools to tap into crowdsourcing in the same way that private companies do every day. We're part of the American Association for the Advancement of Science (the folks who publish the journal Science) and we're backed by the MacArthur Foundation. When you were asked to come on the project, what was the particular gap you were being asked to fill? I think the best way to articulate it is that a lot of people had already seen how powerful it could be to tap into a network of experts online, but were kind of dismayed that not very many agencies were doing so. For example, [now Deputy U.S. CTO] Beth Noveck's work on Peer to Patent set some clear precedents for an online network bringing together policy makers, academics, and private industry in pursuit of a common goal. And Beth's vision there really informed what would become Expert Labs. So, my part was, essentially, helping to get the technology made, but also helping find individual agencies or organizations to be "customers" for it, stakeholders who could make smart use of it. "Closed Doors Are the DRM of Good Policy." The incentive for an outside "expert" to contribute to the work of government is probably obvious for many of us. A hallmarks of geek culture is that many of us have time and insight we're willing to share if given the chance. That, I get. What I'm curious about is what the incentive might be for someone working in government to open themselves up to new channels of information and interaction. That's interesting, I've gotten the opposite question a few times. Policy makers say "Of course we want help! Why would the experts do it, though?" But sticking with what you've said, which I think is a valid concern a lot of the time, I think one key thing is to remember that policy makers in the executive branch (where we've been focused thus far) aren't there for fame or fortune. They're really invested in the success of their particular area of policy. And so, when they're soliciting broad input for ideas in making policy, the fact that they could only have budget to bring a few people into a room for a short period of time is a huge constraint. The idea that lobbyists or anyone else would try to get into that process is a lot like how geeks feel about spammers -- they're a huge distraction from the important work at hand. And to further the analogy, if lobbyists are the spammers of policy making, then closed doors are the DRM of good policy. Obstacles to creativity, inspiration, and just sort of generally an affront to the most creative people in that field. Being open to a social network of contributors helps solve a lot of those problems, and that gets a sigh of relief from a lot of policy makers. That's not to say that some aren't intimidated or even resistant to the idea. But I feel if Expert Labs can open the door to some large number of meetings, we can change the culture enough where the rest of the policy makers will feel like they're missing out by not being part of the opportunity. So, in an ideal Expert Labs use case, you'd have a group of policy makers wrestling with some thorny topic, and you'd come in and equip with the tools to connect them with some knowledgeable group of people who traditionally wouldn't have access to that debate? Is that about right? That's exactly right. I keep pointing to a model of my own personal life, where I asked my Twitter followers what kind of smartphone I should get. And sure, I got lots of the expected responses, "get an iPhone!" or "get an Android!" But one guy sent me a link that said "Here's a list of the most popular handsets in America, and the radiation output that they generate." And that's exactly the kind of serendipity that everyone can understand. Can you give an example the sort of question that policy makers might be wrestling with, and the help that "experts" can provide? Sure. Right now, the White House's office of Science & Technology Policy (OSTP) is trying to make a list of the biggest scientific challenges facing our country and society. This list of Grand Challenges can then be used to focus their energies and efforts and attentions, and it's the sort of thing where they can have lots of great ideas on their own, but there are of course going to be areas of exploration they don't know about. So instead of trying to fly 20 PhDs into a room in DC, we think a perfect situation would be for the White House to ask on Twitter and Facebook, "Hey, what are some of the important scientific breakthroughs we should be focused on?" What's the next moon landing or human genome sequence? And instead of working from a set of a few hundred ideas, maybe 100,000 people will have a response to that, an answer. And Expert Labs can provide the technology to collect those answers, give policy makers tools to filter them out, and we can publish the responses for anyone in the public to analyze. "They're Just Scratching Their Own Itch." In the work they've done so far in collaboration or participation or whatever you want to call it, the Obama administration has used off-the-shelf software like Google Moderator and IdeaScale. Why spend time and money building new tools? I think Moderator and IdeaScale are great tools for the entire federal government to have in their arsenal. But right now, we actually don't have platforms that learn from the leading-edge of successful web communities. For example, a fundamental requirement of participation in many of the IdeaScale deployments that agencies have today is that you would have to visit that agency's website. Now, it's a great platform, and that's totally appropriate for people who are engaged in the dialogue enough to know what agency to talk to. But I think we have a premise at Expert Labs that there's a much larger public of very smart people who might not know which agency is responsible for which projects, or that might not regularly visit .gov websites. So maybe we can give them the chance to engage right on the social networks like Twitter and Flickr that they're using already. That's actually new enough where we have to invent a little bit of technology to make it possible. And the fortunate thing is that that's interesting to the private sector, and to weekend hackers, on its own merits. So they're just scratching their own itch, but helping their country make better policy at the same time. Which brings us to ThinkTank. Can you explain that project? Yes! It's an incredibly exciting platform. As soon as we realized that policy makers wanted to connect using social networks, I started looking at what platforms out there were allowing for large numbers of responses. And interestingly, Gina Trapani had built one just to support her writing at Smarterware and Lifehacker (both of which she was the founding editor of), since she crowdsources so much of the ideas she writes about. That evolved into what's become ThinkTank. It's an open source application that can run on any web server (or cloud hosting), and it aggregates your messages on social networks like Twitter and Facebook. It collects the replies, stores them in your own database, and can give you all kinds of insights like which of your followers is most popular, or what answers people had to your question on all these different networks. ThinkTank has attracted a really enthusiastic community of developers, and is one of the youngest open source apps ever chosen for Google's Summer of Code, where they sponsor students hacking on open source projects. For me, it's just a fun tool. Any programmer can download it, hook it up to their Twitter or Facebook account, and do cool things with that data that the Facebook or Twitter APIs would never support. It's really important to me that we have this open source project that's had remarkable early success and our lead coder is a woman, and she's out, and we have prominent developers in our community who are gay, who are women, who basically don't look like every other open source app out there. Essentially, that inclusiveness isn't just the goal of the crowdsourcing, but of the technology development itself -- because we all build our cultural assumptions into the tools we make. "The Choice of T-shirts are Men's Medium or Large." Is that a characteristic of good development in this case, or a happy accident? It was a prerequisite. Absolutely essential. That's interesting. Is that, in your view, an ethos that's coming from the White House? Hmm, I hadn't thought of it that way for me. It was more about what I saw as the failings of the tech industry where people would excitedly say, "You can get people to contribute to an open source app just by giving them t-shirts!" And the choice of t-shirts are men's medium or large. "We Don't Have to Seek Permission to Engage"
A government geek question: there are legal restrictions in place that shape how people can be brought in to advise government. The idea there was to cut down on the amount of "advising" that gets done behind closed doors by people who have never been elected by the public, or appointed by the people who were elected. Have you run into any structural hurdles? There are definitely a lot of rules about involvement, and I'm glad they're in place, since they're there for good reason. What we're doing is trying to work with those rules in a smart way. For example, Expert Labs is part of AAAS, and as a non-partisan independent scientific organization, they're able to provide technology to the government. Other organizations could do something similar without having to deal with the complexity of the GSA schedule by listing their applications on the Apps.gov app store. But for the most part, the fact that we're not part of the government has been an opportunity, not a constraint. We can move more nimbly by being on the outside, we don't have to seek permission to engage with a really broad audience of contributors (we have a wonderfully diverse set of coders working on ThinkTank), and we can have almost all of the dialogue we need simply by engaging through the new public channels that this administration has opened up. That's a real sea change for organizations like ours. "I Found a Lot of the Conversations in Silicon Valley to be Meaningless." You're known in the online world as someone who curates the web, shares insight into culture, and occasionally wears inappropriate t-shirts in the New York Times. What made you want to devote your attention to working with government? And part B, how did you get into this? Hah! I like that question. Well, for the better part of a decade, I was out there trying to get people blogging [as Chief Evangelist at Six Apart, makers of Movable Type]. It meant a lot to me that people would express themselves online, and use this medium in the way that all of us who loved the web would hope could happen. And then January 20th of last year, WhiteHouse.gov relaunched and it had a navigation tab that said "blog." So I really felt like, the point of pushing the rock up a hill was over. It's not downhill, but it's maybe level ground. A week later, I went to India, visiting my family there in one of the poorest regions of the country, and you know, I have a proud Indian mom so she had told them all what I do, and the stuff I work on. And I wanted to make sure that whatever I worked on next was something that would be meaningful to them, that my cousins and family there could understand and respect. So then I just started exploring, seeing what was possible, having new conversations with people and organizations I'd never engaged with. It helped that I found a lot of the conversations in Silicon Valley to be meaningless and self-absorbed and exclusionary. Obviously, I love the startup ethic, in terms of working really hard and inventing new things and moving really fast. But it became clear pretty quickly that I wasn't government material. I do like to wear goofy t-shirts, or say silly things on Twitter sometimes, and you know, any agency wouldn't put up with that sort of thing. So I thought, "Maybe there's a middle ground here." And fortunately a lot of smart people in the government, in the White House, at the MacArthur Foundation and at AAAS, all agreed. Now I feel like, I have this little bit of attention or focus that I can bring to things because some people online know who I am. How can I use that as the raw material to do some really meaningful work? Can I use my love of hacking media and organizations in a positive way, not just to do entertaining and fun stuff, but as a way to route around red tape and the like? So that's every day for me now. I am loving it. How did this all work out between the White House and AAAS? You know, I actually don't know. There was a proposal called the "policy innovation network" that came out of efforts during the transition period. And it actually predates my involvement. By the time I read the proposal, MacArthur and AAAS were already behind it, and I just renamed it and kind of rebooted it. "There's No Such Thing as 'the Government.'" You've been at this about six months, if my math is right. As a tech transplant to the world of government, what if anything has surprised you? I think there haven't been surprises so much as reminders of things that we learn in social studies class when we're ten, but that maybe we forget to revisit. There's no such thing as "the government." There are individuals, and agencies, and departments, and they all have their own thoughts and cultures and traditions. If you stop engaging with government and governance as this unknowable monolithic entity, and instead as just people doing work, it's a real revelation. It's very similar to the tech industry, where coders forget that users don't think of "I'm running Adobe Photoshop on Microsoft Windows on a Dell laptop." They just think "I want to tweak my photos." They don't have a sense of all of the layers and abstractions that make it possible. They just care about the end result. I do think it's really important to highlight the sea change in culture in so many aspects of the federal government, though. The GSA launched a URL shortener at go.usa.gov two months before either Facebook or Google had launched one. When the White House uses ThinkTank in a few weeks, they'll be ahead of what the private sector is doing in terms of crowdsourcing questions using social networks. Before I got involved in this world, I would never have imagined that was possible. The White House has an iPhone app, and their video's up in HTML5 formats. These are things some of the biggest media companies in the world haven't been able to do yet. There's overlap between what you're doing, and what you hear from people working with tech in the disaster world. That is, you go to where people already are, the networks they're already using. Yes! Yes, 100% yes. The arrogance of both the tech and government worlds is in thinking they know better than regular folks what people want. Instead, just honor their choices and lives, and go where they are. A techPresident interview with Craig Fugate, Director of FEMA, on using social media to cope with disasters.